“Iceland I” by Doris Madsen. “Cut Throat Island, Labrador” by Doris Madsen. 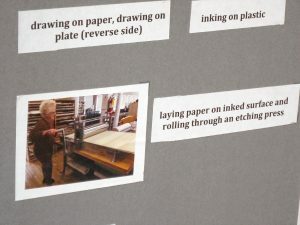 Doris Madsen is seen here laying paper on an inked surface and rolling through an etching process to create her artwork. 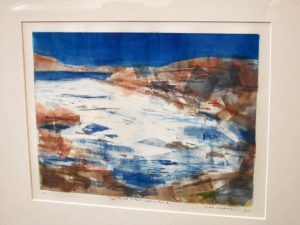 At first glance, Doris Madsen’s artwork seems to be a collection of slightly abstract paintings inspired by nature: a frigid island shore, an overhead bird’s eye view of Greenland, the stark Icelandic countryside, and a collection of pitcher plants. But on closer examination, the process for making these images is much more involved with dense layers of ink through monotype printing. Madsen’s artwork is on display through April 25 as part of her exhibit at Springfield Central Library titled “Breathing In, Monotypes.” Just as the painstaking process of monotype printmaking might not be as obvious to visitors, the exhibit itself wasn’t easy to find as Springfield’s Central Library is under construction. The main entrance on State Street is currently blocked off as construction crews rebuild the entryway staircase, but signs led to a winding path through the Springfield Museums, past metal sculptures of The Grinch, Horton the elephant of other Seussian characters in the Dr. Seuss National Memorial Sculpture Garden. Construction workers with drills and other power tools in hand worked on the back entrance of the library as I observed the scaffolding covering the grandiose 19th century building that houses the Springfield Central Library. Past rows of computers in the library’s reference section, the exhibit can be found the back wall of the room. Madsen, a retired Springfield librarian, left a note for visitors describing her artistic process: monotype printing. The first painting in the exhibit, “Iceland I,” is pastoral with light green etches and swirls mixing with muddy browns that are abstract, but seem to convey rolling hills. Meanwhile, there’s a dark purple and bluish hued line of dots running through this landscape, which looks to be a river or stream. The sky is made up of wisps of light blue that seem like they could stretch beyond the confines of the monotype painting, creating a faux horizon effect — ironic considering horizons themselves are illusions. Feelings of tranquility abound in this Icelandic scene with naturalistic imagery that calls on the desire to become lost in the moment. Madsen writes in an artist’s note that the title for her exhibit comes from the 16th century definition of ‘inspiration,’ which she describes as “drawing of air into the lungs.” She adds that breathing is the process by which is the basis of all life and survival. 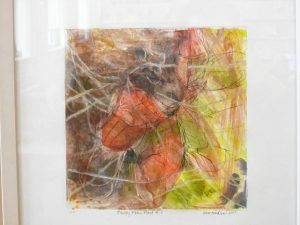 With that in mind, we come to a work titled “Hawley Pitcher Plant 4.” The pitcher plants are red and bulbous, slightly resembling human lungs with deep black lines that look like veins. That resemblance seems like no accident knowing that Madsen’s work is influenced by nature. After all, plants produce the oxygen that we breathe in every day. 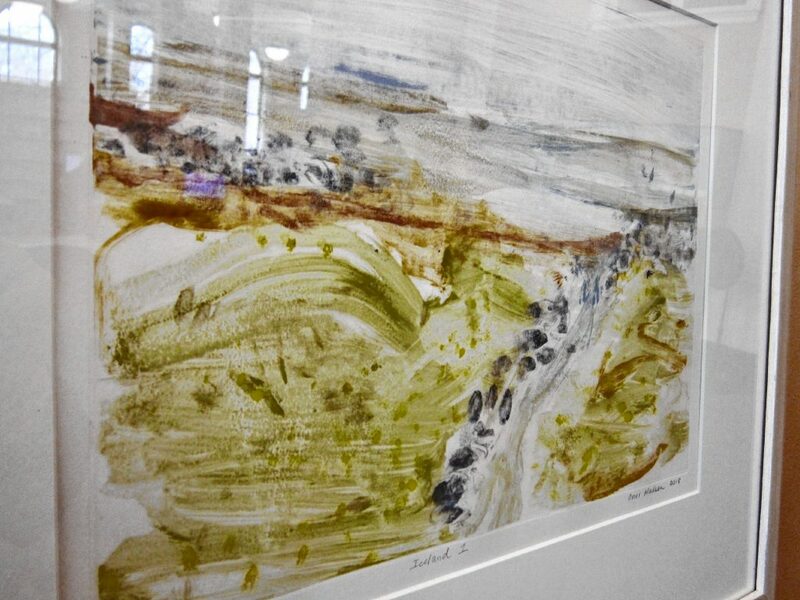 But on the far left of the painting, there are grimy, smoke-colored gray etches, lines, and white slash lines, which seem doom-laden compared with the effervescent grass greens on the right side of the piece. This seems symbolic and perhaps speaks to a broader theme about our own role in the destruction of the natural world. “Cut Throat Island, Labrador,” shows a frigid shore line of snow and mountainous terrain through an abstract lens. There are dark blues that evoke the feeling of swimming in the cold waters of the Atlantic Ocean. The rocky terrain is conveyed with a multitude of colors: coral pink, earthen brown, patches of purple and green. The center of the landscape is a bright white similar to street lights reflecting off new snow after a winter storm. This piece has a sense of isolation to it. Despite the frigid desolation and the harsh climate, there is beauty in the inanimate stone, and the cold surroundings. 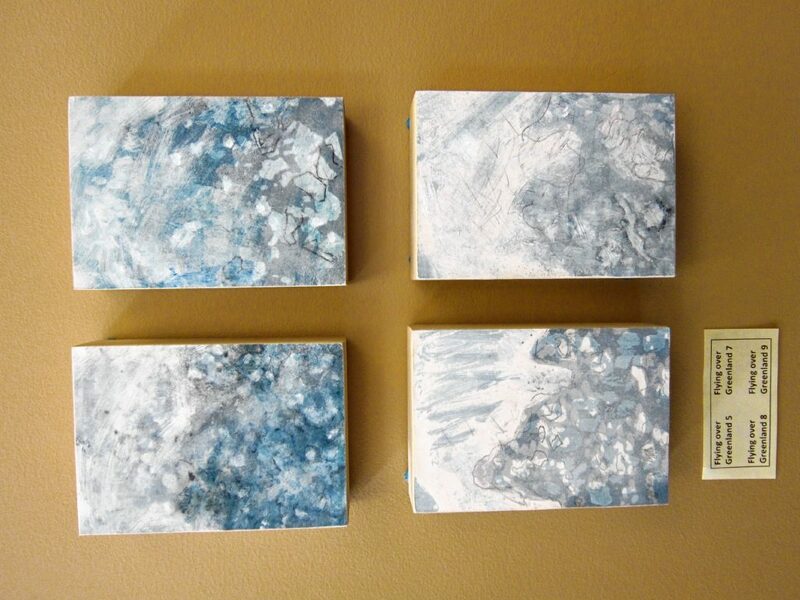 Another piece in the exhibit is a series called “Flying over Greenland,” which consists of four small paintings in the collection: numbers five, seven, eight, and nine. Each piece doesn’t seem to have much meaning on its own, but together one can view a larger picture. 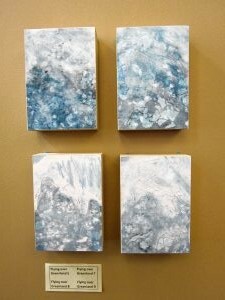 Each piece seems to be an aerial snapshot of Greenland below that together reveal mountains of ice and snow. They convey feelings of smallness in a vast world much bigger than ourselves, which viewers might find humbling.